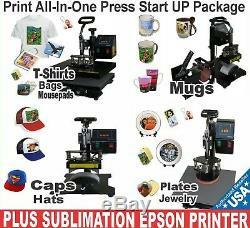 5 in 1 COMBO HEAT PLATEN PRESS TRANSFER SUBLIMATION PLUS EPSON Printer. 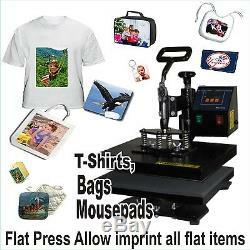 Heat transfer sublimation Starter Package you need and the know-how to do sublimate T-shirt and substrates. Premium sublimation System refillable low cost replacement ink bottles, designed to work with specially designed Epson Printer print continuous inks system (CIS) quick easy refillable cartridge lets use over and over again ready to use. (8.5x 11" letter) (8.5"x 14) A4, B5, A5, A6. Chemically designed free of clog the nozzle print head. No more out of ink frustration low cost replacement ink bottles. Print direct performance with Epson driver software, auto photo Color profile; ICC(International Color Consortium). Doesn't need any other driver. CD software Design, It's simple just with 3 steps. S tart decorating custom gifts and more! For customers, friends, and family. Ceramic Mugs, Glass Mugs, Pint Glass, Travel Mugs, Sports Bottles, Glass Stein, Beer Steins Plates, Tiles, iPhone and iPad cases, Mouse Pads, Coasters, Place mats, Can Wraps, Tote Bags, Keychains, Dog ID Tags, Magnets, Jewelry, Necklaces, and Bracelets, Decorative-Products and others. 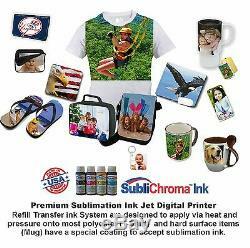 HEAT SUBLIMATION TRANSFER PRINTING STARTER PACKAGE INCLUDES EVERYTHING. DIGITAL EP SON 3640 WF SERIE PRINTER. SOFTWARE OPERATIVE SYSTEMS CD FOR DRIVER. PRINTER Windows Vista®, XP, XP Professional x64. Windows 7, 8, 10 (32-bit, 64-bit). Mac OS® X 10.3.9, 10.4.11 - 10.5. X - 10.6.8 - 10.10. 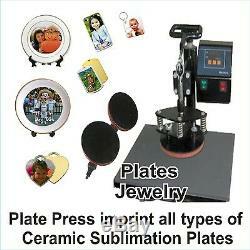 5 in 1 Heat Platen Press 12X15 Sublimation Machine Mug Plate. #1 Platen Press (12" x 15") Telfon-Coated. Flat heat press Fully-assembled machine with platen press. 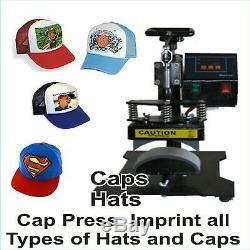 #2 Hat/Cap Press (6"x 3") Curved P. #4 Plate Press (5) Max Diameter. #5 Plate Press (6) Max Diameter. CD SOFTWARE - DESIGN MAKER. 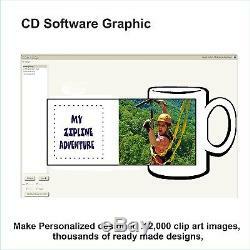 12,000 clip art images. 4 INDIVIDUAL INITIAL Chroma cotton. (1)Black, (1) Cyan, (1)Magenta, (1)Yellow. 4 INDIVIDUAL REFILLABLE CARTRIDGES (Non-Oem). High-capacity, (1)Black, (1)Cyan, (1)Magenta, (1)Yellow. FOR REFILLING CARTRIDGES (Non-Oem) 1 Sublimation Ink Bottle. (K) Black 60ml 1 Sublimation Ink Bottle (c) Cyan 60ml 1 Sublimation Ink Bottle (M) Magenta 60ml 1 Sublimation Ink Bottle (Y) Yellow 60ml. 4 SYRINGES LONG BLUNT NEEDLE REFILL INK. 1 WHITE PLAIN T-SHIRT - 1 MOUSE PAD. 10 CHROMA-COTTON PAPER FOR LIGHT T-SHIRT 8.5X11. INSTRUCTION how to filling ink. INSTRUCTION How to install the printer. INSTRUCTION "How to sublimate items". CD software Design It's simple, just with 3 steps. Design, Pick a design, add. Iron, Heat press and Peel, makes Sublimation. Ink for Epson Digital Printer. Chemical ink versatile print process is designed to apply a mirror image onto paper for transfer to the final substrate. The print image is transferred via heat and pressure onto most specialty sublimation blanks polyester (T-Shirt) and hard surface items (Mug) have a special coating to accept sublimation ultra ink, the result is a premium, full-color, bright-quality image that will not peel or wash away is extremely durable. Gifts and products for customers, friends, and family. 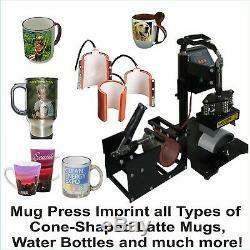 5 in 1 Heat Press 12"x15" Sublimation Machine Mug Plate Cap I ncludes. Brand new 8 in 1 multi-functional heat press machine, the machine body is made of carbon steel for high-intensity collision resistance. The high-quality stainless steel heating plate features high efficient in preserving heat. Updated insertion heating attachment installation provides express attachments change and better stability. This all-in-one press can be used for T-shirts, caps, ceramic plates, ceramic tiles, mugs, coasters, mouse pads, jigsaw puzzles, lettering, other misc. Large 12" x 15" transfer element Provides a big surface to create your own custom T-shirt. Package Content Six Attachment Elements. #1 Platen Press (12" x 15") Telfon-Coated. #2 Hat/Cap Press (6"x 3") Curved P.
#3 Mug Press #1 (11oz). #4 Plate Press #1 5 Max Diameter. #5 Plate Press #2 6 Max Diameter. Power input 110V/60HZ USA Standard. 32 - 430 Fahrenheit degree. Temperature: set the desired temperature. Timer: set the desired time. Intelligent audible alarm Alarm sounds automatically when time is up. Full 360-degree rotation of swing-away design allows the heating element to be moved safely aside. Can be adjusted according to the thickness of the material Detachable lower platform. It is elevated with dual supports. Removable silicone pad and cotton pad. Built-in fuse for safe using. DIGITAL EP SON WF SERIES SUBLIMATION MAKER PRINTER. Engineered for small Sublimation printing business. A powerful, high performance T-shirt printer, the Epson Easy-to-use, Individual refill ink cartridges(oem) can be used over and over again and replace only the color that you'need, With dual Black ink cartridges, this printer has special Sublichroma ink (non-oem) for sublimation This budget-conscious performer is ready to handle all your high-volume printing projects. Printing Technology: 4-color (CMYK) drop-on-demand MicroPiezo® ink jet technology. Minimum Ink Droplet Size: 2 droplet sizes, as small as 2 picoliters. Windows Vista®, XP , XP Professional x64, Windows 7, 8, 9, 10 (32-bit, 64-bit). Mac OS®5 X 10.4.11, 10.5. Color Management: Auto Photo Correction, Epson Vivid Color, Adobe RGB and ICM. Corporation manufacturers are registered trademarks. All of the Printer from us, come from authorized. Epson, Canon, Brother Ricoh, Hp.. 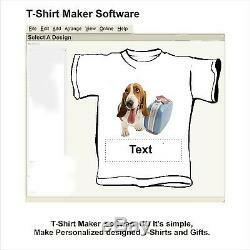 Which has not manufactured or approved sublichroma transfer T-shirt maker. We believe the good communication will resolve any issue. Your satisfaction is our priority. We accept return on this item within 14 days from the date you receive the package. 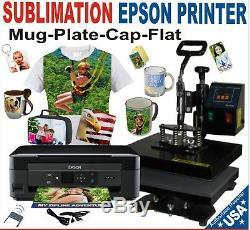 The item "5 in 1 COMBO HEAT PRESS SUBLIMATION T-SHIRT MUG START UP PACK + PRINTER EPSON" is in sale since Saturday, September 24, 2016. This item is in the category "Business & Industrial\Printing & Graphic Arts\Screen & Specialty Printing\Heat Transfer\Transfers". The seller is "heatprintspot" and is located in Clifton, New Jersey. This item can be shipped to United States.